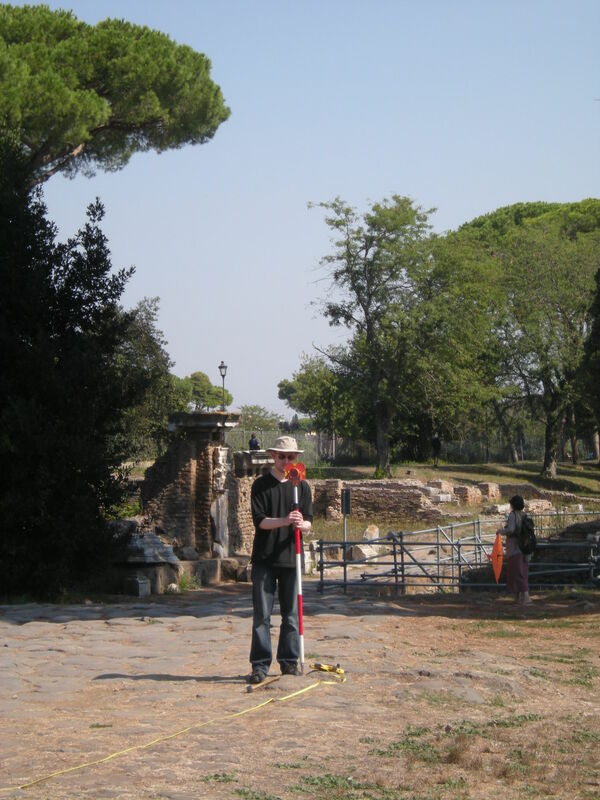 Our two weeks in Ostia have now finished and the team has returned home. The last day on site saw the trenches in the Bivium, the Paleastra, the Foro delle Statua Eroica and the Piazza della Vittora being closed and backfilled, meaning we could leave the site as we had found it. One of this year’s quirkier finds was from the Bivium, where a pawprint on one of the terracotta tiles was uncovered next to a drain. As this trench has been cleaned, the total station has been used to record the geographical points of significant features and findspots to allow an accurate map to be created at a later date. Such records ensure that the information we have revealed during this year’s dig will be available for others to use in the future if needed. 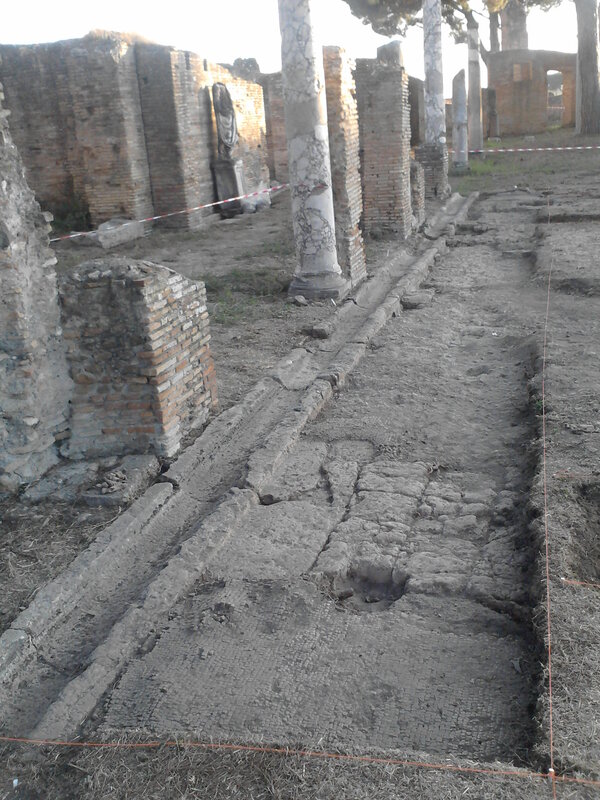 Kent is not the only university conducting an archaeological dig at Ostia Antica; amongst others are the team from Bologna, who are working on the outskirts of the site. They have provided good company whilst we were working in the depot, and on Saturday Luke conducted a guided tour for them of our site. They very kindly offered to do the same for us before we go. Work in the depot has also been completed with all plaster and marble finds being succesfully catalogued and photographed. 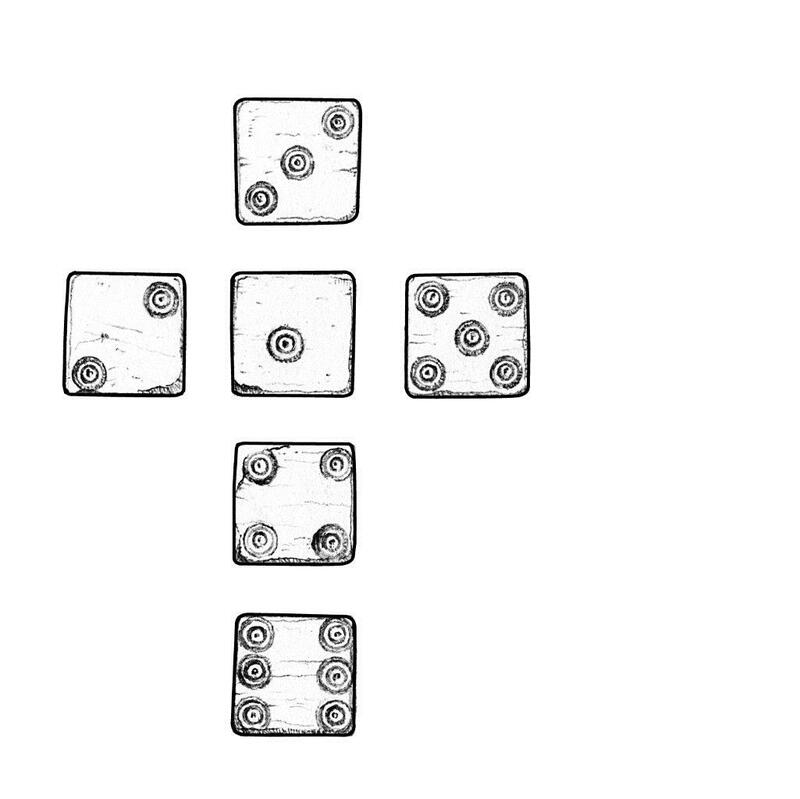 Illustrator Will Foster has been drawing some of the better preserved examples, including a fragments of decorated pottery, an inscribed slate and some gaming dice. One of the highlights of this year’s work has been the rescue excavation and laser survey which we have carried out in the area sacra of the Temple of Hercules. Here the garden service have been busy restoring some of the very crumbly Late Roman walls (here shown after restoration), We are very grateful that the Sopraintendenza allowed us to laser scan them prior to rebuilding, in order to provide a permanent record. They also allowed us to clean this area in order to set the walls into a chronological context. 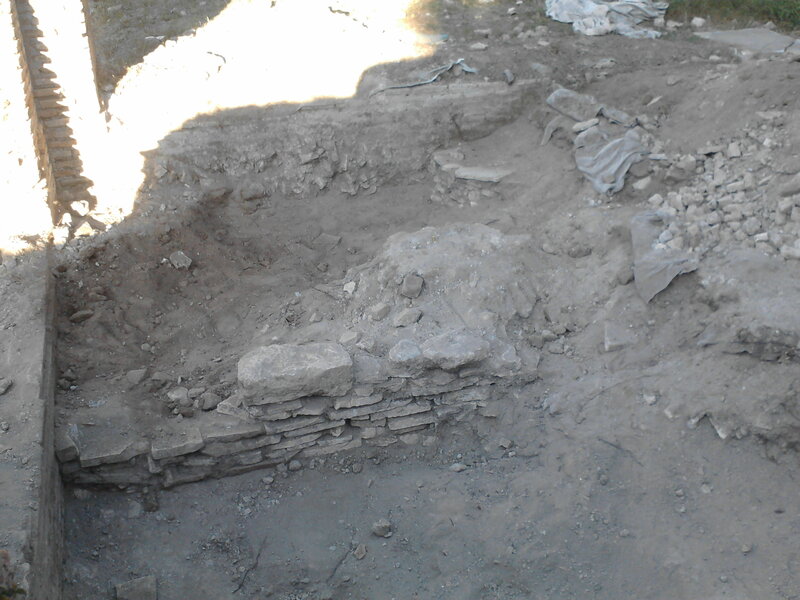 The result has been that we have been able to retrieve coins, pottery and lamps from late surface deposits, which may give us the date at which the area sacra stopped being monumental and in which these walls blocked the view of the altar from the main entrance. It is good to find some intact archaeological layers amidst so much re-deposition and excavation backfill. 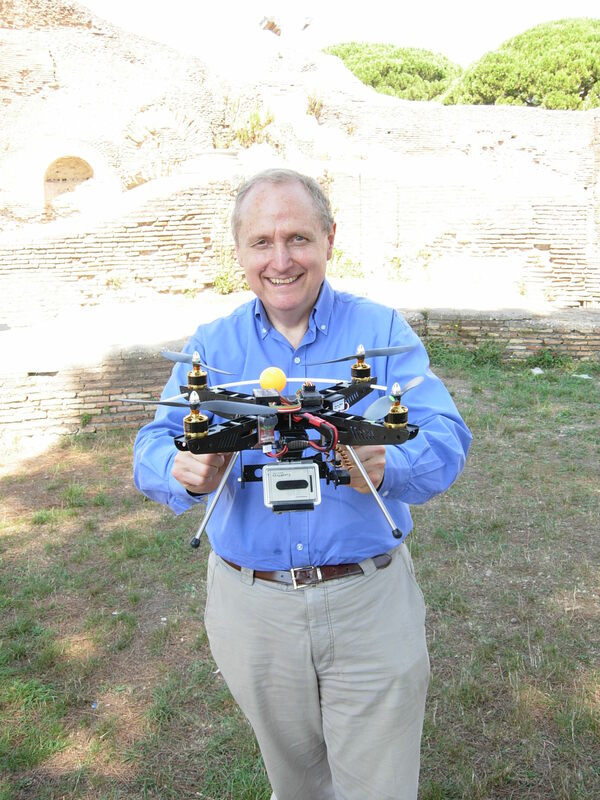 We are looking forward to presenting the laser scans and wall records to Angelo Pellegrino, the chief of the Ostia archaeological service in the next few weeks. It is good to be able to add to our story of public space the fate of the temple squares. If you are interested in this topic you may like to consult a recent book by Luke Lavan and Michael Mulryan on the Archaeology of Late Antique Paganism. See http://www.brill.nl/laa/ for details. 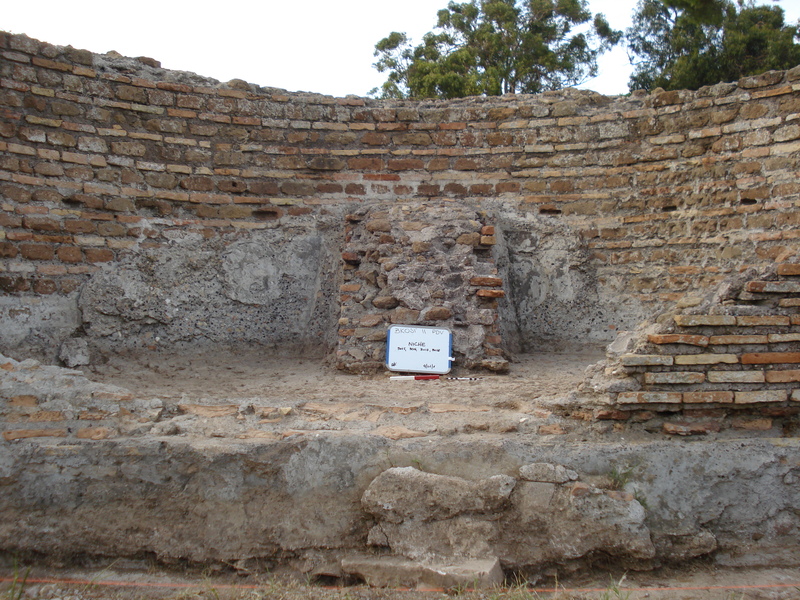 I’ve never been to Ostia before; in fact, I’ve never even been on an archaeological dig before. Needless to say, I jumped at the opportunity to join the Kent University’s excavation in Italy this year as an administrator and archivist. Our group is about 25 people in total from all different nationalities and specialisms which makes for a great mix of people. Staying in tents means that everyone has got to know each other pretty quickly over the early breakfasts, evening meals and buses to site. One of the favourite, non-archaeological, parts of the day seems to be the evening shower, when all the sweat and dirt from the day’s work can be washed away. 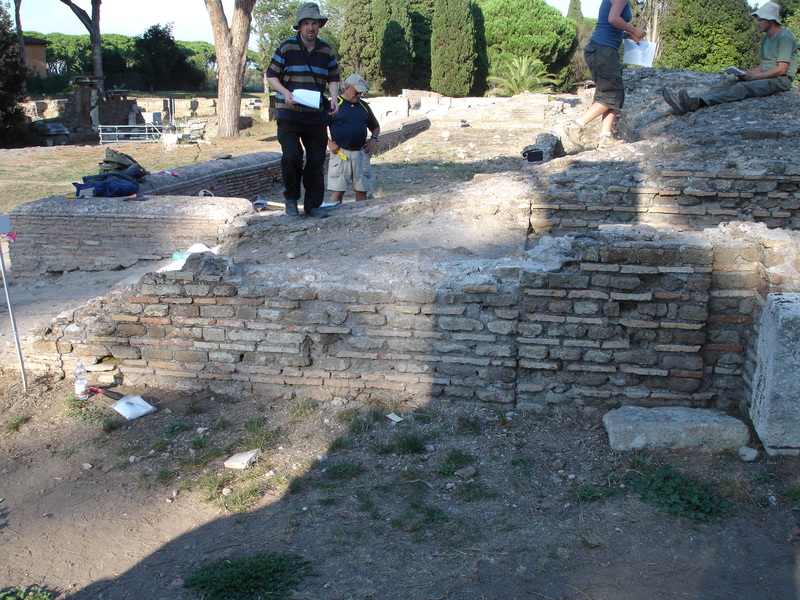 Arriving at Ostia Antica on the first day, my initial impression was the scale of site and its remains. It can be pretty daunting, especially if like me you are armed only with a guide in Italian and a tourist map! Luckily, I had the expertise of one of my fellow participants Julien, who showed me some Late Antique houses and shops, and explained how to spot them. Shop fronts would have been covered with boards or planks when closed, whereas houses had hinged doorways to close them from the street. These left different marks in the stone thresholds; either an incised line for a shop or ledge with circular holes at either side for a house doorway. 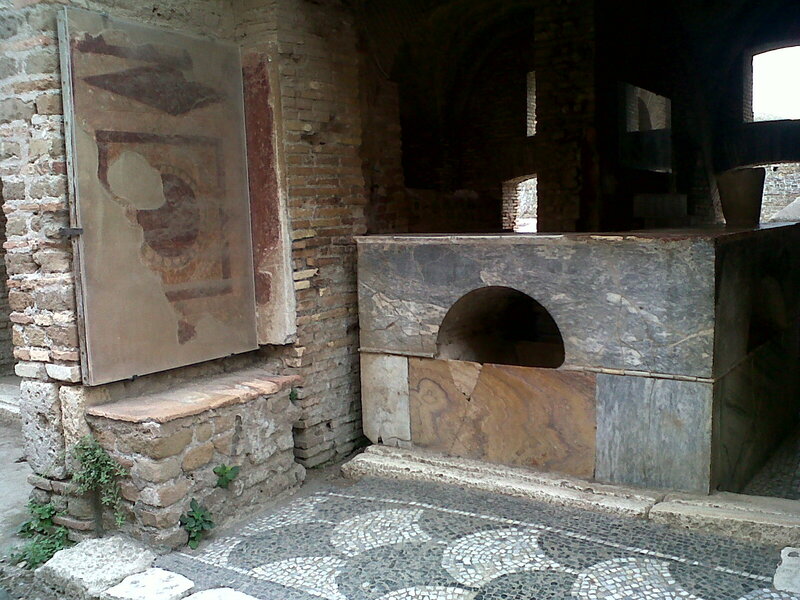 The extant decoration inside these buildings is impressive, with the remains of opus sectile floors, marble fountains, bars, wall paintings and mosaics still remaining from when they were inhabited. Walking through the same streets and building entrances as the Ostians of Antiquity really gives you a sense of the city during its working life. Seeing the team excavating is especially interesting; there are four sites being worked on at the moment small teams of people. The first step is devegetation which prepares the area and structures. 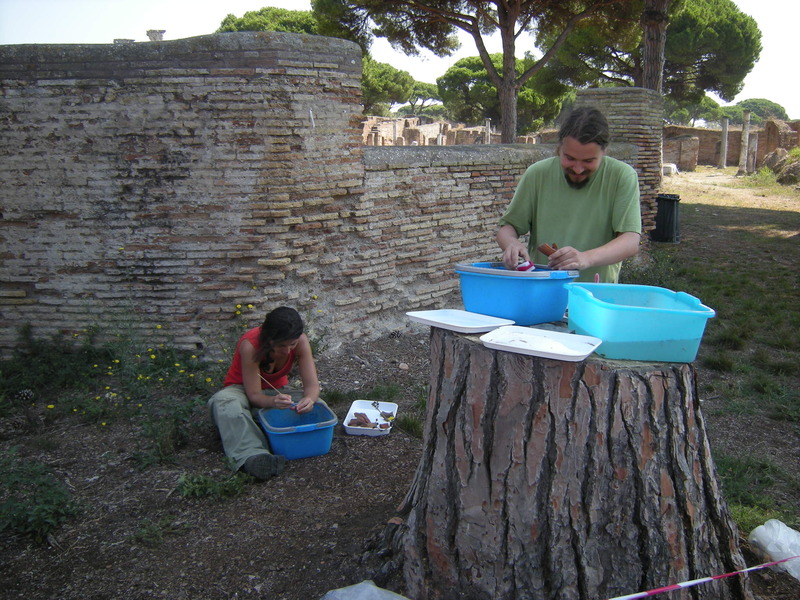 This can be hard work, especially in the hot Roman sun, although it’s a task not necessarily devoid of interest; Faith found a Roman coin in one of the walls of the Foro della Statua Eroica, whilst clearing the ground in the same area also revealed the existence of a walled up room. I’ve also been lucky enough to join Elizabeth, Aoife and Solinda in the depot at the top of the site, where finds are cleaned and catalogued. 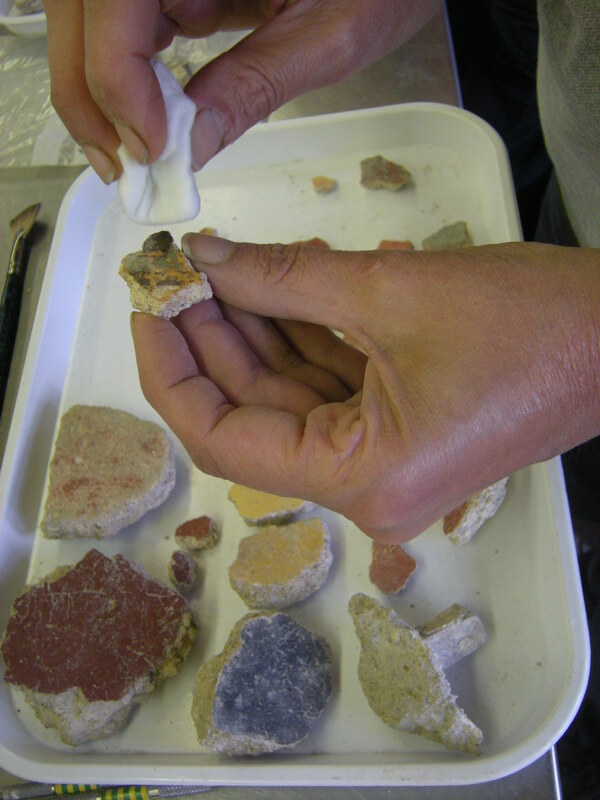 Fragments of vividly painted wall plaster are brushed free of dirt and then the coloured surface cleaned with acetone. Some of the examples I’ve handled are polychromic, featuring coloured lines and other decorative features; others are important for their reverse sides, which still have the imprints of the craftsmen’s fingers and the lathe walls the plaster was originally attached to. Site is hot and dusty, with stones worn smooth from the centuries of people walking over them. This can make it a pretty hazardous place to work, not forgetting the mosquitoes, which seem to have a taste for me in particular, the few scorpions which have been spotted, and the snakes (of which only their shedded skins have been found so far!). There are also some tiny lizards which scamper around the ruins, basking in the sun, which entertain the diggers. The dig is incorporating some pretty high tech equipment – our colleagues at Birmingham University have been laser scanning areas of the city for us, which allows the analysis of details you can’t see with the naked eye. 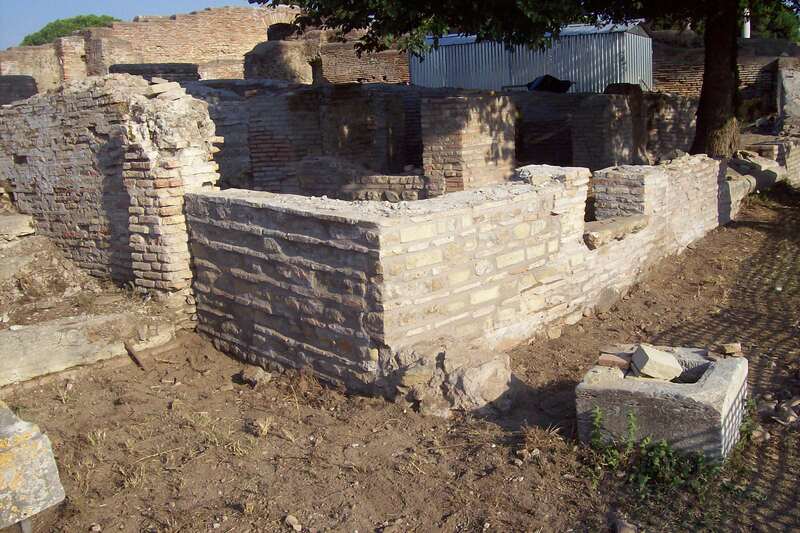 It also means that 3D computer models of the Ostian buildings can be made at a later date which is fantastic for Kent’s Visualisation of the Late Antique City project. Elsewhere trenches are beginning to appear. The bivium has already been excavated in previous years, however the complex nature of the archaeology there means that this year the guys are pulling up the geotextile that sits below the topsoil and protects the evidence below. 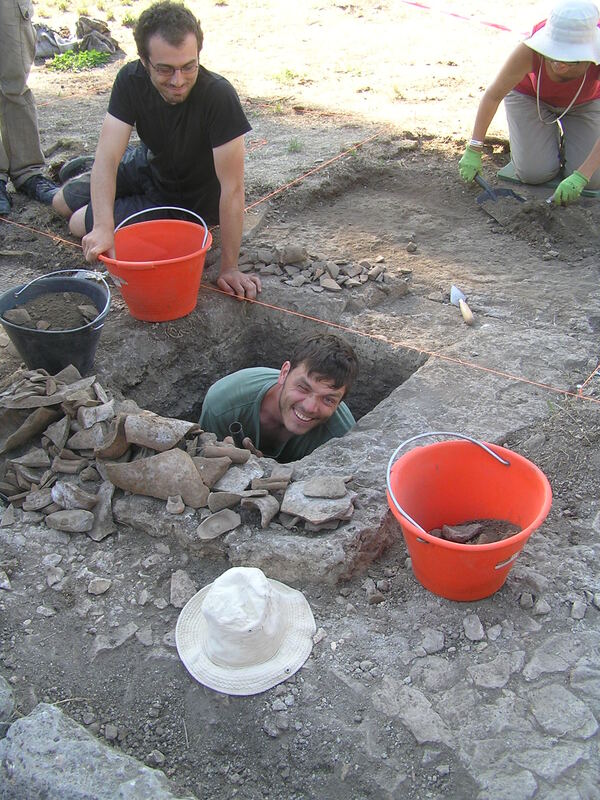 This will allow them to re-evaluate the archaeology and hopefully draw some useful conclusions. In the paleastra, the trench has revealed what looks like a well and drain. There have also been a few finds already, including pottery sherds and glass tesserae. Devegetation has finished and trenches have now appeared at the four excavations sites. 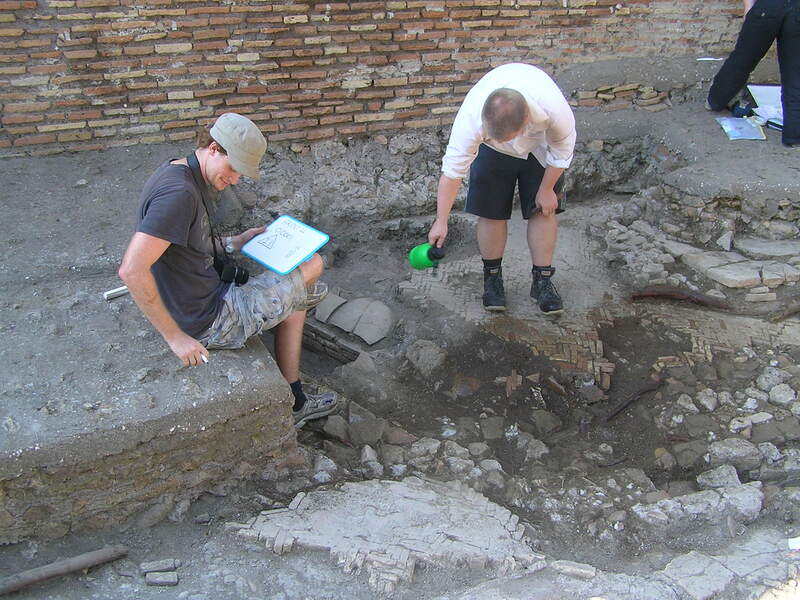 In the palaestra, the main aim of the trenches is to uncover architectural proof of changes to the site in the 3rd and 4th century, particularly the date of the mosaic which covers the whole square. The trenches have revealed the foundation of a series of honorific monuments set against the portico, and a possible early paving, underneath the mosaic. The finds so far have included glass fragments and wall plaster. 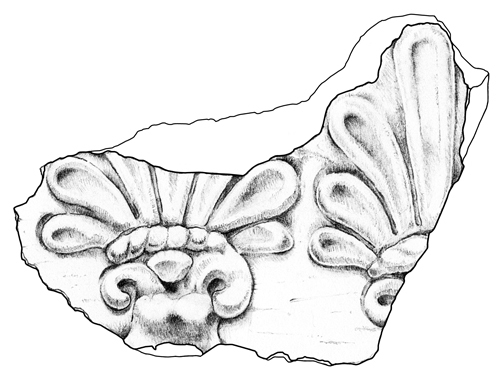 A large coin was uncovered and a metal fragment that has the shape of a vessel rim. One of the highlights has been the discovery of a possible well or cistern, filled with an enormous amount of ceramic fragments mainly from amphorae. The bottom of the hole has not yet been found, so further digging is required. What is thought to be a third century spoil heap has also been uncovered and the soil sieved for finds. The majority of these are pieces of pottery. The Bivium has already been excavated in previous years, however the complex nature of the archaeology there means that this year the guys are pulling up the geotextile that sits below the topsoil and protects the evidence below the team are trying to draw new conclusions from the archaeology found in the previous year’s excavation. The stratigraphy is very complex, featuring a basin and opus spicatum flooring from a Republican house. This house was then demolished to make way for a portico on the crossroads. This itself was then replaced by the later nymphaeum. There are also several water channels or drains which intersect and cut each other off, creating a series of building phases which are complicated to interpret.